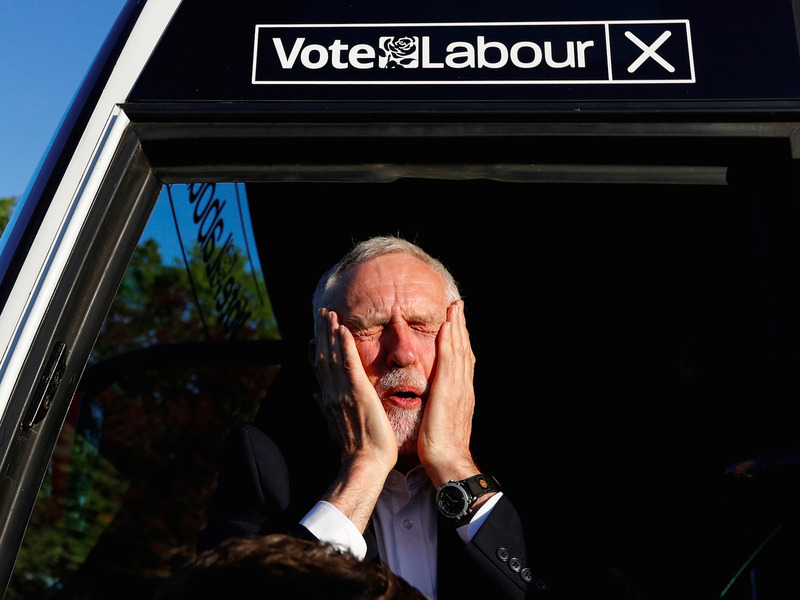 Jeremy Corbyn, leader of Britain's opposition Labour Party, reacts as he gets on a bus after a campaign event in Leeds, Britain May 9, 2017. 1. President Donald Trump fired FBI Director James Comey on Tuesday, the White House said. The reason given for Comey's firing was his handling of the Clinton email investigation. However, the firing coincides with grand jury subpoenas being issued as part of the FBI's investigation into ex-Trump advisor Michael Flynn's connections to Russia. 2. French insurer AXA plans to float its operations in the United States, combining life insurance and asset management, in the first half of 2018, it said on Wednesday. Reuters reports that the announcement came as AXA reported that first quarter revenues had dipped 0.1% from the same period last year to €31.6 billion (£26.57 billion), as stronger property and casualty premiums slightly offset a weaker performance at the company's life insurance business. 3. Traders are doubling down on their bets against Snapchat's parent company Snap. They've pushed bearish wagers to the highest level since the company's March 1 initial public offering, selling a whopping $100 million (£77.1 million) short over the past week alone, according to data compiled by the financial analytics firm S3 Partners. 4. Standard Life and Aberdeen are preparing to lose around 800 jobs if their £11 billion tie-up goes ahead, as the pair unveil further details of the blockbuster deal which is expected to close in mid-August. The Telegraph reports that the two investment giants published their merger prospectus on Tuesday evening, confirming that a restructuring following the proposed tie-up will see almost 9% of the combined 9,000 roles go "to maximise operational efficiencies and cost synergies." 5. Small and medium sized businesses risk losing out on billions in European Union funding when the UK formally leaves the trading bloc in 2019. The EU has earmarked £3.6 billion in regional development funds for UK firms until 2020, but nothing beyond 2021, according to a report from the Federation of Small Businesses (FSB). 6. Apple has made a move to get in bed with you. The iPhone maker has acquired Beddit, a startup that makes a sleep sensor. 7. ECB President Mario Draghi is speaking today. Draghi will be giving a speech on "the impact of monetary policy of the European Central Bank" in the Netherlands at 12.00 p.m. BST (7.00 a.m. ET). The text of the speech will be released on the ECB's website. 8. US stocks slid on Tuesday amid alacklustre session. All three major indices moved less than 0.3% as stocks stayed mired in a tight trading range. 9. Asian stock markets are higher. Japan's Nikkei is up 0.27% at the time of writing (6.10 a.m. BST/1.10 a.m. ET), the Hong Kong Hang Seng is up 1.04%, and China's benchmark Shanghai Composite is up 0.10%. The Nikkei is getting a boost from a weak yen, which traders see as supporting exports. 10. Bitcoin seems unstoppable, topping $1,700 for the first time on Tuesday. The cryptocurrency is up 5.71% at $1,758.45 (£1,357.25) a coin, as trade grinds higher for the 16th time in 18 sessions. It has gained nearly 50% during its run. Something happened while we were trying to play your video! Click replay or simply reload your page.